Saturday also sees Sets and Ceili Workshops, Two Hand Dance Workshops, Gaelic Singing Workshop, and ‘Dance the Tune’ with Stephen Gillespie. There will be a big concert on Saturday night with Cherish the Ladies. Sunday sees a Sean Nós Workshop with Joe. Sets and Céilís in the Nesbitt Arms Hotel at 3.00pm. The Finale Concert with The Friel Sisters takes place in the Beehive Bar. There will be various open air sessions all weekend in town. For more info contact Pat on 087 6900714. 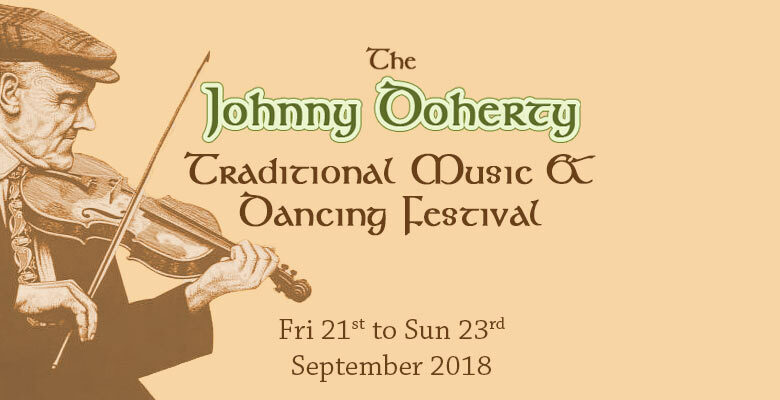 Details are on our Johnny Doherty Festival page. The new term for our free preschool year began on 3rd September. Children’s swimming lessons for ages 5+ started up again on Friday 7th September in Ballyshannon pool. Bus leaving Ardara at 5.50pm and returning at 9pm. Another season is upon us and the Club will be back up and running from this Thursday 13th September from 7-8 o’clock in Glenties Comprehensive school gym. Cost €3 per night, player registration to Basketball Ireland, Northwest Area Board & insurance cost per year is €20. The club provides basketball for u-14, u-16 and u-19 girls. All new members welcome from 6th class girls to u-19’s! Training nights will be on Monday nights from 7-8 o’clock from Monday 17th September. As usual we are short of help for some teams and anybody willing to lend a hand, either on a coaching or administrative level, please let us know. Coaching courses will be organised where needed. All Clubs depend on Volunteers and we are no different. Art Classes will commence Friday evening 21st September from 7 to 9pm upstairs in the Heritage Centre.